Origin and Habitat: Hankey to the Fish River, Eastern Cape, South Africa. Habitat: It often grows under bushes, seeking a little shade from the fierce sun in the Bushveld and dry Karroid scrub community. Description: Hawothia attenuata is extremely variable and comes in many varieties, some are solid green with only few tiny white smooth or knobby tubercles, while on the contrary, other are banded with white horizontal transverse lines. 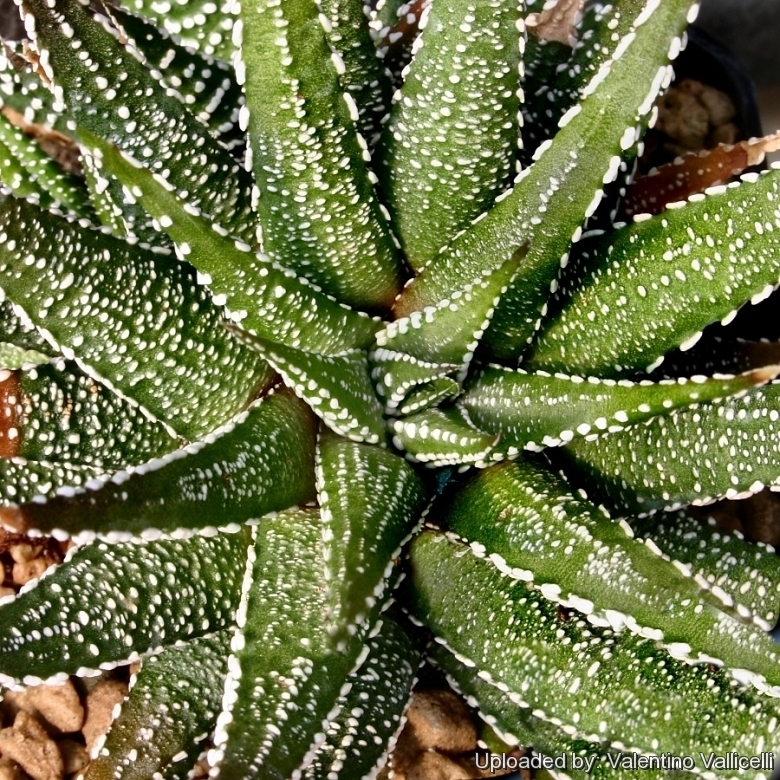 The Forma clariperla distinguishes for its leaves that are evenly covered with many large, pearly white, separate tubercles that are usually scattered, or only vaguely arranged in stripes on the back or along the margins. It is a low growing and almost stemless clustering perennial-succulent that can eventually form large mat-like clumps and is one of the most common species in cultivation. Rosettes: Almost stemless, 6-12 cm diameter, 6-13(25) cm tall, heavily clumping. Leaves: Dark green, concave, slender, pointed and strikingly spotted with white pearly tubercles. Tubercles are scattered on the upper surface of the leaves. The lower surface of the leaves may have no-confluent bands of tubercles. Flowers: Relatively inconspicuous tubular white-greenish, with spreading petals. Bloom time: Spring to summer, but it can be ever blooming if you snip off each bloom when it dies.